Obama Clinches N. Carolina, Clinton Wins Indiana Sen. Barack Obama won a decisive, double-digit victory in North Carolina's Democratic primary Tuesday, while rival Sen. Hillary Clinton held on to just barely win the race in Indiana by two percentage points. Neal Conan hosts an NPR News Special at the Newseum in Washington, D.C.
Sen. Barack Obama won a decisive, double-digit victory in North Carolina's Democratic primary Tuesday, while rival Sen. Hillary Clinton held on to just barely win the race in Indiana by two percentage points. How will the presidential hopefuls proceed as they enter the homestretch to the Democratic nomination? Neal Conan hosts an NPR News Special at the Newseum, Washington, D.C.'s museum devoted to journalism and the news business. Ken Rudin, NPR's political editor, writes the weekly "Political Junkie" column and has a weekly podcast called "It's All Politics"
It was among the most dramatic turns yet in the Democratic presidential race, and it may turn out to be the last. On a night when Sen. Hillary Clinton's comeback campaign seemed poised for another triumph — one that would vault her into true contention once again — it was Sen. Barack Obama's campaign that surprised instead. He defied polls and expectations in both the North Carolina and Indiana primaries, and his renewed vigor as a competitor carried the first-term senator from Illinois to the brink of the Democratic nomination. Obama won the last large state to vote, North Carolina, by an impressive 14 percentage points. His vote margin of more than 230,000 in the 10th most populous state exceeded the margin by which Clinton won Pennsylvania, the sixth most populous, two weeks ago. He was projected to take 15 more delegates than Clinton of the 115 available in North Carolina, a net gain that would eclipse the 12 she gained in Pennsylvania. "It's good to win a big state," the Illinois senator said to a cheering crowd in Raleigh, the state capital. Indeed, for his campaign, it was almost a do-or-die necessity. He had last won a top 10 state on Feb. 5. 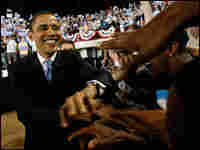 By winning North Carolina big, Obama reversed what had been a downward spiral in his campaign in recent weeks. While he surely will hear more about his long association with the Rev. Jeremiah Wright in the future, that controversy will apparently not be enough to cost him the Democratic nomination. About half the primary voters in each state told exit pollsters the Wright matter had been important to them. Of these, most voted for Clinton. Of those who said it was not important, an even larger majority voted for Obama. For Clinton, the failure to break through in North Carolina may have meant the loss of her last best opportunity to halt her rival's march to the nomination. She put a brave face on it when she spoke late in the evening to her supporters in Indiana, where she claimed victory even though it would be another two hours before it was clear she had won. After watching a wide early lead disappear, and after waiting six hours for Lake County, near Chicago, to report, she held on to win by about 22,000 votes out of more than 1.2 million cast. The dwindling of that lead in Indiana, which took place throughout the night as Obama was racing ahead in North Carolina, contributed to a sense of disappointment on the evening for backers of the New York senator and former first lady. Most recent polls in both states had shown her on the march, winning easily in Indiana and holding her rival to a modest margin in North Carolina. There had been speculation she could win both states. Early waves of exit polls pointed in this direction. And while she spoke of going on to the next primaries in West Virginia and Kentucky — and on to November — Clinton on this night lacked the exuberance she had shown after winning Pennsylvania and Ohio. Indeed, she was not the fiery performer she has been in recent rallies. She came to the stage and almost immediately began speaking, and after her remarks did not linger to enjoy the adulation of the crowd. 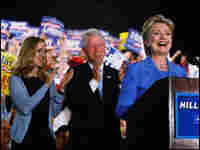 Her husband, former President Bill Clinton, stood behind her looking sunburnt and subdued. Her daughter, Chelsea, who has accompanied her through months of intense campaigning, was at her side. And the rally mixed the words of a winning night with the mood and atmosphere of a campaign nearing its end. NBC reported that Clinton had canceled plans to appear on the morning news programs, but the Clinton camp said this was not true. Initial reports that she would not have public events until Thursday were contradicted when the campaign announced she would leave for West Virginia at 9 a.m. Wednesday. Much may depend on the reaction to these latest primaries among superdelegates who have yet to commit to either candidate. Some 270 remain on the sidelines, and a movement among them to one candidate or the other might well determine the next phase of this historically lengthy campaign. Obama has continued to whittle down the Clinton lead in superdelegates, which stood at nearly 100 in early February and at just 15 this week. He has received twice as many new superdelegate commitments as Clinton since Ohio, and twice as many since Pennsylvania. His latest rebound is likely to bring more to his side. The superdelegates will be the focus for both campaigns now more than ever, because after this week's voting, only six events remain with a total of just 217 delegates at stake among them. It has been clear for some time that neither candidate could reach the 2,025 threshold for nomination without superdelegates. But Obama is now within roughly 200 of that number. So a near-even split in the remaining pledged delegates, coupled with less than 40 percent of the remaining superdelegates, would make him the nominee. Rather than dispute this math, the Clinton campaign this week has asked news organizations to stop referring to the 2,025 number. They contend that the addition of the Florida and Michigan delegations will raise that number to 2,209. The status of the two delegations is pending before the Democratic National Committee panel that banished them for holding early primaries, and that panel is to meet on May 31. This week's voting continued a pattern by which Obama has dominated in Atlantic states from Georgia north through the Carolinas to Maryland and Delaware, while Clinton has done better in the industrial Great Lakes states of Indiana, Ohio, Michigan (where Obama was not on the ballot), Pennsylvania and New York. It also provided fresh evidence of the divisions in the party over race, gender, age, education, income and religion. Both candidates pledged their support once again to the eventual nominee. Both have tried in recent days to renew their concentration of fire on Republican John McCain, his party's presumed nominee. But McCain has continued to enjoy the spectacle of his two prospective challengers devoting so much of their time and assets to their contest with each other. It is a contest begun shortly after the midterm elections of 2006 — what Clinton in Indiana called "a long journey" — and one that may finally be approaching its end.